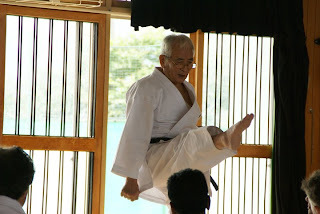 This photo of Tasaki Hanshi is my favorite. Even as an older man, his kicks were so fluid and still blindingly fast. You can see the relaxation in his entire body. I've seen that foot lash out in a kin geri to the groin of a young yudansha who was not paying proper attention when Hanshi was explaining something to the group. Wham! So fast, yet with enough kime so as not to really hurt the fool...just enough to let him know his inattention was out of order. It was so fast as to almost be invisible. That was in his seventies.